Suda51 might be the game industry’s most unique talent, delivering title after title of unabashed uniqueness and bizarre experiences. Killers with multiple personalities, demon hunters with phallic weaponry, and a chainsaw-wielding cheerleader with her boyfriend’s head attached to her waist are just a few of the things to come out of Suda’s mind. His latest project, which could best be summed up as a demon-hunting James Bond that travels to the moon, is predictably insane…even by Suda51 standards. 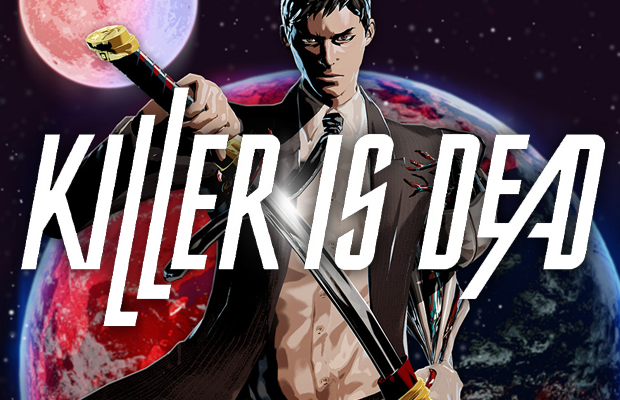 Killer is Dead, a sort of spiritual successor to Killer7 and No More Heroes, features an assassin named Mondo Zappa, who works for the Bryan Execution Firm, taking contracts to hunt down demons and dangerous individuals. Mondo’s globe-trotting adventures bring him into contact with a sadistic codpiece-wearing overlord named David, who might have a role in Mondo’s past. To reveal too much more would do a disservice to the well-written character of Mondo, though the amount given in the game was just a bit too sparse (likely intentional) and it would be great to see where a sequel would take the intrepid agent. The game as a whole sports an unabashed affinity for the absurd, leading to many laugh-out-loud moments as well as the occasional darker turn. Far from being tonally inconsistent, it works quite well for the overall vibe. Suda drew a great deal of information for Mondo from Ian Fleming’s James Bond novels. Killer is Dead wears its influences on its sleeve, featuring an assassin for hire with enough class and smoothness to spare. Mondo wears an impeccably crisp suit, keeps his cool in any situation, and delivers his trademark eponymous catchphrase before the final blow is struck on a target. These are delivered brilliantly; a single button is pressed and held following a prompt onscreen, and when released, delivers the blow. These executions are always framed with a hugely appealing visual shot, and are always satisfying to witness. The game also draws from Japanese cinema (in addition to a brief and fantastic reference to Italian monster movies), science fiction, and just a touch of grindhouse. It’s an insanely weird and irresistibly unique blend. The music is eclectic and unique, and most of the voice acting (save for Mondo’s aggressively irritating assistant) is well-done. The superior voice acting comes from the Japanese actors, and this option is indeed present in the main menu. The game itself is presented in a slick, bright style that evokes the style of No More Heroes with a bit more detail and higher contrast. The resulting effect is one of the most striking games of 2013. Combat is simplistic, and occasionally repetitive, but it works. One button is used for attacking with the katana, while another is used for guard breaks and another for dodging. Each of these work best in certain situations, and together they make for a generally satisfying system. Some enemies can only be attacked after performing a guard break, and others are best counterattacked. Still others are easier to defeat if Mondo can dodge their attacks first. These dodges, when successful, will launch Mondo into a frenzied counterattack where the entire screen shifts into white and red, and mashing the attack button will unleash a devastating flurry of sword attacks. It’s an awesome, devastating attack. Even more devastating is a sort of finishing move which stops time and sends Mondo dashing straight through an enemy, severing anything in the path of his katana. There’s no way around it: Mondo is just plain cool when he uses this ability. Mondo sports a cybernetic arm, named Musselback, which can transform into four different weapons including a gun and a giant drill. Musselback is mapped to the shoulder buttons and works quite well (including a slick headshot animation) but feels weirdly incongruous with the melee attacks. Switching between them isn’t a hassle but still feels a bit clunky, due largely to the fact that you have to aim before firing, which severely limits the field of view and leaves Mondo open to attacks from nearby enemies. It’s an uncommon problem, but in the latter half of the game gets mildly frustrating when enemies on the ground coordinate with ranged enemies in the rafters. Musselback is fueled by blood, which flows freely from slain enemies and feeds right into the cybernetic arm. Blood is essentially the ammunition for the arm, which is fully powerful as long as there is blood to support it. Demons will also drop crystals, which are spent to upgrade Mondo’s abilities and weapons for a couple of new moves or more power for his katana and Musselback. There aren’t a lot of upgrades available, but most of what’s there ends up being useful throughout the game. The game stumbles with the highly bizarre and rather uneasy Gigolo side quests. These are about what they sound like; Mondo meets up with a girl, and a little minigame plays in which the perspective switches to first person, the girl glances into Mondo’s eyes, and away at intervals. When the girl, glances away, you must glance down at her breasts and crotch to fill up a meter far enough to give her a gift. You can’t be caught looking, however, or another meter starts to fall. This minigame is poorly thought out, wholly unnecessary, and borderline creepy. The gifts are pricey, might not work, and get more expensive each time you buy one. You can’t have more than one of a specific gift, but if you run out of gifts altogether you automatically lose. These bits are technically optional, but they’re also they only way to obtain the Musselback weapon variants, which are fairly important. Another milder disappointment involves the boss battles. While the bosses themselves are far from lacking creative design, the fights themselves are tragically lackluster, mostly comprising the same basic dodge/counterattack formula that the rest of the game follows, with the more varied exceptions in the back half of the game. It’s essentially just pattern recognition, and coming from a Japanese action game (a genre known for bombastic boss fights) it’s a glaring flaw. That said, the bosses themselves are very interesting; most of them sport a great backstory and are well designed and acted. It just would have been nice to have a bit of the inspiration and variety that started showing up in the second half of the game interspersed through the entire experience. Killer is Dead is not unlike Suda51’s other games in that it is bogged down with several issues. However, also like the developer’s stable, it’s tremendously bizarre, and absolutely endearing for it. Grasshopper Manufacture makes games that it wants to make, and while this doesn’t always pan out to common denominator mass appeal, it does make for a singular, refreshing experience. There are areas of Killer is Dead where one might wish things have gone differently, but Suda’s irresistible panache for the surreal and the bizarre will delight the like-minded, even in the face of vanilla gameplay. Killer is Dead was developed by Grasshopper Manufacture and published by Xseed Games. A PS3 copy of the game was provided by the publisher for review purposes.